There is no information availble on the Ethnic Groups in Ulaanbaatar. Population: 1 million 106.900 in 2010. Growth Rate: 4.06% / year. There is no information available on the Railway Station available in Ulaanbaatar. Ulaanbaatar has a large Railroad Station, which is a major stop over on the Trans-Mongolian Railway. In addition Ulaanbaatar also has a fully modern International Airport which lies just outside and to the south-west of the City center of Ulaanbataar at a relatively small distance of 18 kilomters (9+ miles). Ulaanbaatar International Airport is the largest and only truly international airport in the Republic of Mongolia. It is situated at about 18 kilometers southwest of the capital Ulaanbaatar. The Airport is open to various sorts of air traffic such as International Flights, Cargo operations, VIP flights, charter flights, general aviation and emergency landings. Traveling time from City center to Airport and Vice Versa: around 20 minutes. The airport is currently serviced by public buses, airport shuttle buses, and taxis. Most travelers prefer to reach their hotel or accomodation using a Taxi, however Bus services are frequent and convenient. The Airport at Ulaanbataar was the first airport to be constructed in Mongolia, opening on February the 14th of 1957. It was named as a Buyant-Ukhaa airport one year later in 1958. The first flight connections from Ulaanbataar international routes to Moscow (U.S.S.R.) and Beijing in the Peoples Republic of China. In the last 20 years Ulaanbataar's international airport has greatly expanded and improved its services. Since December 21 of 2005, the airport has been officially renamed "Chinggis Khaan" International Airport in honour of the 800th anniversary of Genghis Khan's official enthronement as "Emperor of Mongolia" (Great Khan). The airport is the main base of operations for national carriers MIAT Mongolian Airlines, Eznis Airways and Aero Mongolia. All passengers have to travel the distance to the City to reach their hotel. Currently some 6000 people are employed by Chinggis Khaan Airport, with around 2000 working at any given time of the day. According to historians, the "City" of Ulaanbataar was first established in the year 1639 AD, several centuries after the fall of the Great Mongolian Empire which Capital Karakoram had been the first true Urbanized city in Outer Mongolia. The first "city" of Ulaanbataar was not a city at all, but was established as a moveable Buddhist Monastery, around which clustered the "Ger" of supporting and passing nomad families. At the time it was known as Örgöö, which translates from Mongolian as "Palace-Yurt". I.e. the name for the Monastery Tent that made up the center of the community and so formed the first reason for the nomads to settle in one place. As such, at the time, the "City" of Ulaanbataar was not much more than a veritable tent camp which was moved no less than 30 times before it finally settled in the current location in the the Tuul River Valley. The actual City of Ulaanbataar as an urban center only started in earnest with the conclusion of the Treaty of Nerchinsk (Russian: Нерчинский договор; Chinese: 尼布楚條約) in 1689 AD and the subsequent development of what has become known as the "Tea Road". Previously, there had been virtually no trade between the Chinese in the south and the various Mongolian Tribes in the north. Remaining emnities between Han (Chinese) and Mongolians during the Ming Dynasty (1368 AD - 1644 AD) had prevented trade by and large, although in the late 16th century the Ming finally allowed for cross-border trade with the Mongolian Tribes. This had greatly improved relations with the otherwise war-like Mongolian Tribes, but it was not until the Russians solidified their hold on Mongolian Territories and the Manchu Qing Pacified the regions south of the newly created "border" that any real ties and traffic became possible. Subsequently, building on sparsely existing trading paths pioneered by "Shanxi Businessmen" in the Qing Dynasty Era (1644 AD - 1911 AD), the Tea Road became an trading route between China and the newly arriving regional power of the Russian Empire, which by that time had sufficiently expanded westward to come into recurring conflict with Qing China. However, after conclusion of the Treaty of Nerchinsk, settling borders as well as trading issues, mutual traffic and economic ties blossomed leading to the establishment of permanent trading routes across the Mongolian plain, and small settlements to act as trading posts strung along them. Ulaanbataar was one such trading post on the route northward into Siberia and Russian Territories and it became one of the main trading posts in Mongolia. Several decades later, in 1727 AD, the Treaty of Kiakhta (Russian: Кяхтинский договор; Chinese: 布連斯奇條約/恰克圖條約) fixed what is now the border of Mongolia west of the Argun River and opened up a large scale caravan trade between Beijing, the Capital of China and Russia far to the west, along which route Ulaanbataar became an indispensable stop-over. Although trading links already existed at that time, it was the Caravan trade that eventually really "made" the city of Ulaanbataar. That is, almost one and a half century after its first reported existance, the "felt city" of Ulaanbataar had become important enough commercial center in the trading system of Tea Road (the overland trade route from Peking to St. Petersburg, the Capital of Tzarist Russia) to have it make a final settlement in its current location in the year 1778 AD. From these humble beginnings the city of today arrived. Apart from changing locations, the "felt city" which has become today's Ulaanbataar, also changed names several times in its existence. Initially, between 1639 AD and 1706 AD, the "settlement" was known as Orgoo, from the Mongolian word for palace. From 1706 to 1911 the name was Ikh Khuree, and from 1911 to 1924, when Chinese forces took over large parts of Inner- and Outer-Mongolia, it was briefly known as Niislel Khuree. There after the name of the city was changed again, reflecting the Russian dominance over Mongolia, the defeat of opposing Chinese Forces at Niislel Khüree (Ulaanbaatar) and the establishment of the First Republic of Mongolia in 1921 AD. Since October 29, 1924, the name of the settlement in the Tuul River Valley has been known as Ulaanbaatar, meaning "Red Hero". With this the current name reflects the 70-year period of Russian-dominated 'revolutionary' government in Mongolia which ended with the Democratic Revolution in Mongolia (Mongolian: Ардчилсан хувьсгал, Ardchilsan Khuvĭsgal, Democratic Revolution) in the year 1990 AD Eversince, Ulaanbataar has been the seat of the Mongolian Parliament and the Capital of a new Democratic Republic of Mongolia. Urbanization, i.e. the erection of buildings in Ulaanbataar only began in earnest after World War 2. At the conclusion of the war, Mongolia fell decisively within the influence sphere of its larger and powerful neighbor, the Soviet Union (U.S.S.R.) which had long regarded Mongolia as its satellite and began building Mongolia and its Capital Ulaanbataar up as a base for Soviet Influence. It is reported that the urban planning of the current city of Ulaanbataar started in the 1950's during the flowering period of Sino-Soviet relations. In 1956 AD, with the completion of the Trans-Mongolian Railway as a side-branch of the all important Trans-Siberian Railroad the city received further economic impetus and an influx of Soviet soldiers and engineers. As a result, much of today's city has been built between the years 1960 AD and 1985 AD during the Soviet Era. The latest episode in the growth of the city of Ulaanbataar seems to have come with the dawn of Democracy in Mongolia in 1990 and a subsequent string of economic discoveries and windfalls for the nation. Although the first wave of new city migrants arrived after the devastating Dzud of 1990 -killing 100's of thousands of lifestock all over Mongolia- the current growth of the city is being sustained by a nationwide mining boom and resulting economic affluence. Although wealth is not yet a realistic option or goal for most citizens and dwellers of Ulaanbataar, the success and importance of the city is bound to attract more Mongolians and Foreign migrants in the near future. To find out more information on the history of Ulaanbaatar, go to: "History of Ulaanbataar" and "History of Mongolia and the Republic of Mongolia". Hotels in Ulaanbataar City include the Kempinski Hotel "Khan Palace", Gana Ger's Guesthouse, Ulanbataar Hotel, Chinggis Khan Hotel, The Continental Hotel, Springs Hotel, Flower Hotel, Future Hotel, Genghis Khan Holiday Inn, Grand Hotel, Khongor Guesthouse, LG Guesthouse, Voyage Hotel, Selenge Hotel, Shur Yurt Hotel, Sunjin Grand Hotel (west adjacent University), Bishrelt Plaza Hotel, Zuuluuchud Hotel, River Beach Resort (East of Town). There is no additional information available on Hotels in Ulaanbaatar City and Prefecture at this Time. 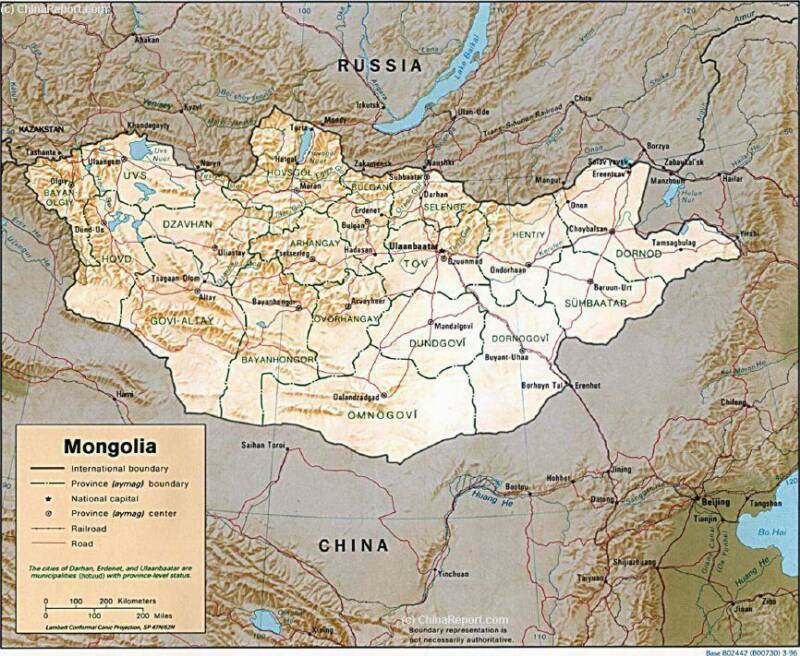 All of the Republic of Mongolia has a continental climate and semi-arid. Weather types are regarded as extreme, with great heat in summer and very low temperatures throughout the winter. Contrary to popular beliefs, Mongolia, as does Ulaanbataar, does not see much snow in winter. The City of Ulaanbataar is situated at a fairly high altitude of 1,350 meters (4,429 ft) in a relatively northern location (high latitude). As a result, Ulaan Bataar is the coldest Capital City on the planet. Winters start early and come suddenly at the end of September. As in the rest of Mongolia, winters are harsh with extremely low temperatures. The yearly average temperature is minus 0.5 degrees Celsius. The average temperature is the lowest in the month of February with the thermometer stuck at around -30° Celsius with air humidity near zero. The lowest recorded temperature was measured at - 57° Celcius in winter of 2001. In March, the Mongolian spring is announced by the average temperature jumping to a mere -10° Celsius, , after which it takes at least to the beginning of the month of April before things start to thaw out. Spring is brief and there are but three short months of summer season before a short fall leads to a repeat of the frigid cycle. On average the hottest month of the year is July, when average temperatures reach around 18° Celsius, with the occasional hot summer day. Summer temperature extremes reach as high as +40°C in the Gobi Desert and +33° Celsius in Ulaanbaatar. On the upside of things; Mongolia may be cold, but it is not a dark place. Air pressures in Mongolia are among the highest in world leading to a pattern of little precipitation and prevailing high winds.Traditionally skies are only severely clouded during the summer rainy season in July and August, so Mongolia, as does UIaanbataar can boast an average of 250 to 280 sunny days per year. Even though it is cold, you still need to bring your sun-glasses (shades). Remember: UV Factors are high, reaching to factor 7 to 8 throughout summer. Most of the summer is dry and in the rainy season precipitation falls in the form of short but watery downpours and storms rather than continuous rains with the prevailing north-western winds quickly dispersing the clouds or driving them away. Spring time in Mongolia and in Ulaanbataar means the frequent occurrence of dust storms blowing in sandy dust from the advancing Gobi Desert. Due to their force, strong winds often turn into devastating dust and sandstorms which blanket the city. High winds occur throughout the year. However notably, the average daily wind speed in January has been low at around 4 km/h (3 mph, or 2 knots) with the highest average windspeed accorring in May at around 14 km/h. The climate in Mongolia has been changing however and in recent years the maximum sustained wind speed In Ulaanbataar has reached 65 km/h, that’s the equivalent of around 40 mph, or 35 knots, much higher than anything previously seen or felt in Mongolia. In the last sixty years the average temperature in Ulaanbataar has risen by 2.73 ° Celsius and the already low average precipitation has decreased by 10mm/year. In recent years the boom of the city and growing industrial activities in surrounding regions have clouded the sky over Ulaanbataar. Especially in winter months, the city suffers from excessive smog and has a serious air pollution problem. Ulaanbataar's smog problem is not set to improve as the Republic of Mongolia and its Capital are in the beginning of a huge development boom. Dust, coal fumes and car exhaust are expected to remain in the coming years. In summer time forest fires have been an increasingly recurrent problem in Mongolia, mainly in the north and the west of the country. Again however, prevailing winds tend to drive the resulting smoke and fumes in the direction of the Capital Ulaanbataar. Large forest fires occurred in the year 2002 and 2003 and may reoccur, especially in dry summers. Ulan Bator is the Capital of the Republic of Mongolia. It lies in the Tuul River Valley and is surrounded and sheltered from high winds by mountains of the Khentii Mountain Range. Boghd Khan Mountain and National Reserve to the South of the City. Over 90% of the area's surrounding the city consist of grassland, with remainder forest (3%) and floodplain of the Tuul River (3%). Ulaanbataar is the Capital City, the main administrative, financial, cultural and educational center of the nation. Today′s Ulaanbataar is a rapidly changing, growing and developing city. The population, which makes up half the population of the entire nation, is engaged in the services industry, trade, finance and most recently mining. There is a huge income gap in the city, with the well to do living in apartments and the majority of new arrivals living in the so-called "Ger" District which is continuously expanding. Residents in the Ger District suffer from poverty, overcrowding, lack of sanitation and a variety of social problems. There are no Maps available on Ulaanbaatar City and Prefecture at this Time. Amsterdam (The Netherlands), Beijing Capital Airport (Beijing, PRC), Berlin (Germany), Bishkek (Kyrgyzstan), Boston (USA), Chicago (USA), Calgary (Canada), Dayton (USA), Edmonton (Canada), Hong Kong (SAR in PRC), Louisvile (USA), Moscow (Russian Federation), Seattle (USA), Seoul (South Korea). Altai (Govi-Altai Aimag in Mongolia), Bulgan (Bulgan Aimag in Mongolia), Dalanzadgad (Ömnögovi Aimag in Mongolia), Khövd (Khövd Aimag in Mongolia), Uliastai (Zavkan Aimag in Mongolia, Ulaangom (Uvs Aimag in Mongolia), Ulgit (Ölgii; Mongolian: Өлгий cradle)(Bayan-Ölgii Aimag in Mongolia), Mörön (Khövsgöl Aimag in Mongolia), Oyu Tolgoi Mine Project (Khanbumbat Airport of OyuTolgoi, in Khanbogd (Mongolian: Ханбогд) Sum, Ömnögovi Aimag in Mongolia). For a full listing, see: Public Transport in Ulaanbataar. General Problems reported for Chingghis Khan Airport appear in spring time when strong winds blow either from the north or west. Dust storms reportedly lead to delays; carriers from PEK and SEL delay their departure, often by 10-12 hrs until evening for winds and dust to settle. The busiest hours at Ulaanbataar Airport for both departures and arrivals are from 10:00 AM to 11:00AM. You are advised to give yourself plenty of time to check-in and pass through security to reach your departure gate. Slow check-in's and security check delays have been reported. The airport experiences the least amount of air traffic between the hours of 9:00 AM - 10:00 AM . Passenger arrival area has Wifi, which is found unreliable by some. Small business lounge available. Small smoking room available. Medical service, bank and ATM's available. There are no special problems relating to the Passenger Terminal at Genghis Khan International Airport at Ulaanbataar. Travels do encounter taxi drivers fighting for the right to transport them to the city center, often at inflated rates. Make sure you do not over pay. Prompt your driver to make use of the taxi meter. Internationally experienced travelers report a very limited number of shops and lounge availability at the Airport (both arrivals & departures) which is a problem which will be solved as the airport expands. Corruption is a major issue in economic life. The rapid social change, the population shift from the country-side and the economic liberalizations that occured since the Democratic Revolution have all left their mark on Ulaanbataar and continue as the country develops from a situation of national poverty towards a situation of shared national wealth. In the "Ger District" lack of education and joblessness lead to alcoholism and depression. An estimated 3000 homeless children live on the streets of Ulaanbataar and in the underground systems that support the heated water system of the city. International aid organizations have set to work among the poor 1/3 of the population, attempting to improve their often desperate plights. The "Lotus House" is the cities first and most well-known shelter for homeless children. YouTube Video: Underground Children of Ulaanbataar - Plight of the Hopeless. corruption scandals and of course the prevailing climate. Nevertheless progress is being made. In 2013 Ulaanbataar is expected to open its 4th power station, adding much needed electric energy to the fast modernizing city and its many modern appartments and households. National Parliament of Mongolia, Mongolia National Chamber of Commerce and Industry, Central Post Office, Dragon Trade and Service Center, Mongolia Ministry of Defense, National Emergency Management Agency, Mongolia National Data Center, National Center of Standardization and Measurement, Xac Bank, Golomt Bank, Natsagdorj Library. Mongolia International University, Mandakh Accounting University, Health Education University, Academy of Political Education, Mongol Farmers College, Military and Defense University, Mongolia University of Film, Music and Dance College of Mongolia, School of Information and Communication Technology, Ulaanbataar Mongolian and Turkish School, China School, Erel Russian and Mongolian School, American School of Ulaanbataar, Elite International School, Don Bosco School, many kindergartens. Mongolia National University Hospital, Family Hospital of Bayanghol 11 Horoo, Bayangol District Policlinic, Policlinic of Bayanzurkh District, State Mental Hospital, Chunelmi Dental Clinic, Mongolian Dentist Center, Gyas Medical Center. GOYO Cashmere Factory, MONOS Farm, Mandah Casing, Landbridge International Freight Forwarder, MCS Coca Cola plant, MCS Asia Pacific Brewery, Mongol Import Export Company. The Russian Church of the City, is situated in the western parts of town at some distance North of the Main Train Station of Ulaanbataar. It is closely related to the Ger District. The Roman Catholic Cathedral of Ulaanbataar can be found in the eastern section of the city, right adjacent and to the south of the University of Ulaanbataar. Although Ulaanbataar is not a fully modernized city yet, the new commercial boom has transformed the city and brought with it a fair amount of new malls and covered shopping marts for everyone's convenience. One need not go hungry or thirsty either, regardless of the prevailing climate extremes. A mainstay of the menu in Ulaanbataar is Mongolian Barbecue (or Grill). New restaurants have added to the already exotic tastes of Mongolia, and several bars and cafe's cater to the growing middle class and expat community of the city. Many smaller restuarants and snack-places van be found around town. Shopping in Ulaanbataar is an enterily unique experiencem with the choice between glamorous and stylish Malls and the still prevailing open and rather country-styled markets of Ulanbaataar you will likely not be bored. As is the case everywhere, bargain hunters must go the extra mile and head for the various hidden corners of the city, mainly in the various parts of the Ger District where local markets cater to the needs of the substantial lower income section of the citizenry. Especially street markets are open all year around, regardless of climate. For the Full Story and Information on what to do in- and around Ulaanbataar, check the chapter on "Entertainment and Leisure in the the City of Ulaanbataar" >>>>>.